The EIA/TIA puts the standards in UTP cable, and when cabling a network there are two standards. T568A and T568B these standards are important when deciding to put a crossover cable or straight through cable. This tutorial is going to be talking about when and where to apply these different standards. We are going to be focusing on the UTP cable and with the RJ-45 connectors; in order for the communication to work properly we need to make sure we understand where to put these cables. Let’s first look at the RJ-45 connector, this connector has 8 pins and each copper wire. For the standard T568B the colors are almost the same but with a few differences. These standards are put together for one reason, to make the data or electic signal travel up to 100 meters. Now you could make your own standard and devices would be able to communicate but not has far and it may even cause transmission errors in the cable. Who knows? But for one thing it would make difficult for another person to learn your color code. So when setting up cable the first thing you need to choose is what standard to use. After you picked you standard can you just connect anything and everything with the same pin out? No! For Different devices like a PC to a switch, switch to a router, etc. Will usually have a straight through cable. Meaning the pins don’t change. If you have the same standard on one end of the cable keep it same on the other end. So for example if you had T568A on one side put T568A on the other side of the cable. That’s that! The standards can get confusing if you over think them. There are other sites out there that go over why the different standards and why some devices send and receive on other pins. But the one thing to remember is that the colors don’t really mean anything as long has the pins or pairs match with the other end. 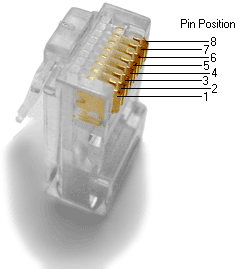 Remember this depends on the type of cable, straight through will match the pairs/pins. Crossover will mix pins 1,2,3, and 6.